Lending money at triple-digit interest rates to hard-working families is just plain wrong, and Colorado voters should not let billion-dollar payday lending industry continue this predatory and deceptive practice. That is why ProgressNow Colorado has endorsed Proposition 111, which will put an end to predatory payday loans in Colorado. These loans target the most vulnerable voters and charge interest rates as high as 215% to line the pockets of payday lenders. This means families who need a couple hundred dollars are often trapped in a vicious cycle of debt. With these types of loans, lenders have direct access to the borrower’s bank accounts–so they can go into a person’s bank account and take their money without permission. This must stop. Voting YES on Proposition 111 will stop it. Step 1: Visit the YES on Proposition 111 website and Facebook page. Like and share to show your support! Step 2: Do you have a personal story? Now is the time to speak out for change. Click here to share your bad experience with the payday loan industry. Your story could help make a difference in November. 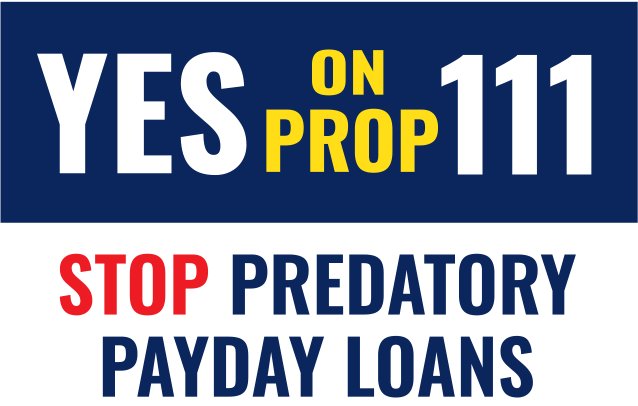 ProgressNow Colorado is proud to support Proposition 111 and, with your support, we can stop predatory payday loans in Colorado.